Kumbabishekam poojai at Saidapet Arulmigu Karaneeswarar temple commenced today. Kumbabishekam at Saidapet Arulmigu Karaneeswarar temple will take place on 7th June. Legendary playback singer P Balasubramaniam is going to give a big treat to his fans and music lovers on 24th May 2015 at Kamarajar Arangam AC in Teyanampet. Chennai. 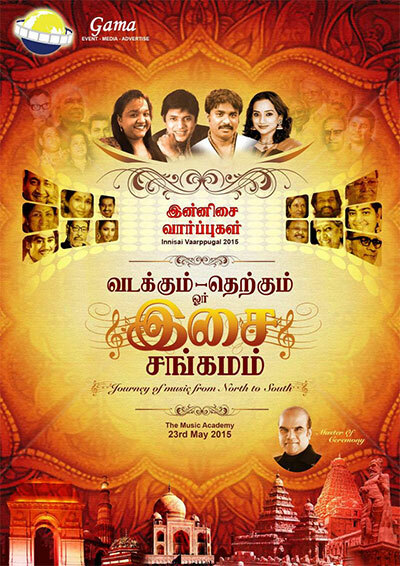 A music concert called Innisai Vaarpugal 2015 is being organized on 22nd May. Indias First Neon Night Run in Chennai, Madurai and Coimbatore. In Chennai, Neon run is going to held on 3oth May, Coimbatore on 5th June and Madurai on 6th June 2015. 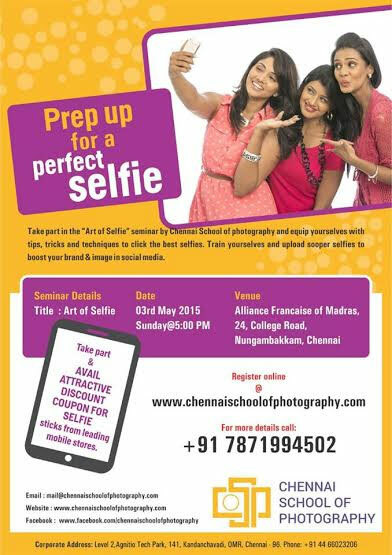 Chennai School of Photography offers unique selfie training course - ART OF SELFIE’ in Chennai. Chennai Puthaga Sangamam’s book exhibition will be held at the YMCA Royapettah from April 13 to 23.